Christopher Frost | Brew Up! A cup of tea is important to keep coding throughout the day but, the art of a good cuppa can’t be over looked. All tea comes from Camellia Sinensis, an evergreen shrub native to Asia. Depending on where it’s grown, when it’s harvested and the preparation you end up with all the different types of tea. Try them out and find your favorites. Even two different brands of Assam black tea can taste different. If you want to try something very British give Tregothnan tea a go. A great tea company that actually grows tea here in Great Britain. Steeping tea, also known as brewing tea, is a big subject. Once you’ve chosen your preferred leaf, you need something to brew it in, some hot water and time. You can brew in your mug with tea bags or a loose leaf infuser otherwise you will need a teapot of some description. One of the most disastrous choices of teapot in history resulted in the Boston Harbor incident of 1773 (and some very cold and weak tea). The political fall out between British tea aficionados and the would be colonial tea brewers became a pivotal moment in the history of two great nations. If you want to go the standards compliant route you will need a white porcelain or earthenware pot. Water is quite simple: use filtered if possible, especially if you live in a hard water area. You may end up with scum on the top of your tea otherwise, it’s not pleasant and rather embarrassing if drinking with others. As for the temperature and time required for the perfect brew, Wikipedia has excellent guidance that I shan’t reproduce here. The gold standard for builder’s tea is fresh boiled water, one milk and no sugar. To keep things simple you can get a clever automated brewing machine by Mr Blumenthal. You need something to drink your tea from, a mighty chalice. Again, if you want to go for a standards compliant cuppa you will need a white porcelain or earthenware bowl. A traditional tea cup is good but personally I prefer something bigger, a simple mug. Provided it’s a sensible size and clean your options are many and varied so it’s hard to go far wrong. This is entirely down to personal preference but milk is normally taken only with black tea. This is because most non-black teas don’t have a robust enough flavor to be tasted through the milk. When to add milk has been a hotly debated subject. I’m not sure why as adding milk before you’ve finished steeping the tea is a disgusting habit and you should take a good hard look at yourself if you’ve ever done such a thing. Some biscuits make an excellent companion to a cuppa tea. Dunking a biscuit in your tea to soak a little up is a noble but dangerous tradition. The danger is polluting your carefully prepared brew, from small crumbs to a full scale biscuit collapse. The structural integrity of your biscuit becomes an important consideration when dunking. HobNobs by McVities are well regarded in this respect (just ask Peter Kay) but my personal preference is for malted milk biscuits. While the malted milk biscuit doesn’t have the greatest integrity, making it a risky choice, the flavor combination is excellent. For something a little sweeter give custard creams a try, the cream filling reinforces the structure of the biscuit making it an safe choice for novice dunkers. If you’d like to dunk a little deeper have a read of the articles on teadunking.co.uk . 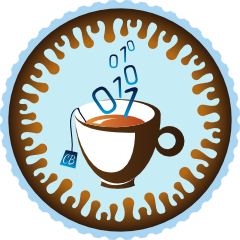 Now go forth and quaff, sip, slurp and dunk your way to better code.